Olea Europaea (Olive) Fruit Oil, Carthamus Tinctorius (Safflower) Seed Oil, Sesamum Indicum (Sesame) Seed Oil, Helianthus Annuus (Sunflower) Seed Oil, Vitis Vinifera (Grape) Seed Oil, PEG-25 Glyceryl Trioleate, Macadamia Integrifolia Seed Oil, Aleurites Moluccana (Kukui) Seed Oil, Citrus Aurantium Dulcis (Sweet Orange) Peel Oil, Lavandula Hybrida (Lavandin) Oil, Citrus Medica Limonum (Lemon) Peel Oil, Citrus Aurantium Bergamia (Bergamot) Fruit Oil, Citrus Grandis (Grapefruit) Peel Oil, Cedrus Atlantica (Cedarwood) Bark Oil, Pogostemon Cablin (Patchouli) Oil, Salvia Sclarea (Clary Sage) Oil, Rosmarinus Officinalis (Rosemary) Leaf Oil, Pelargonium Graveolens (Geranium) Flower Oil, Fusanus Spicatus (Australian Sandalwood) Wood Oil, Amyris Balsamifera (Sandalwood) Bark Oil, Linalool, Limonene, Sorbitan Trioleate, Tocopheryl Acetate. Great for sensitive skin, dissolves sebum, moisturizing, leaves skin "glowing", only need a small amount, smells great (citrus-y), natural pump is sold separately - i definitely recommend this to conserve product and for hygiene reasons. cost seems high, but a bottle lasts me almost a year with daily use on my entire upper body so it is actually very cost effective I cannot recommend this cleanser enough. This, along with Merlot Moonlight Radiance Night Cream, has dramatically improved my skin. After years of using products made for acne I realized that they were only making things worse. I get blackheads, pustules, and cysts on my face, neck, back, chest, and upper arms - seems to be a combination of thick sebum and skin that doesn't exfoliate very well naturally. My skin is also dry/flaky, yet VERY oily at the same time, and extremely sensitive to just about everything. I use this as you would any oil cleanser... I use about a pump (you do havemassage into dry skin at least 5 min, longer is better. Then I wet a washcloth with very hot water (not hot enough to burn!) and lay over my skin to steam, then wipe away and repeat. This product emulsifies with water so it rinses off easily, leaving skin feeling soft and moisturized but still clean. 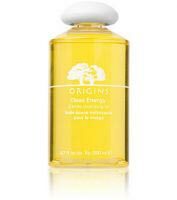 The whole experience is very relaxing, plus massaging the oil in helps to dissolve the hard sebum/oil and encourages circulation. This is a very gentle way to get rid of all types of acne, balance dryness/oiliness, and calm inflammation. When I am diligent with my routine my face is 99% clear and probably about 70% better from the jaw down - I think because these areas are less oily naturally.